The vSphere ROBO license model is perfect for organizations that have Remote Office Branch Office (ROBO) locations with a few hosts running workloads. 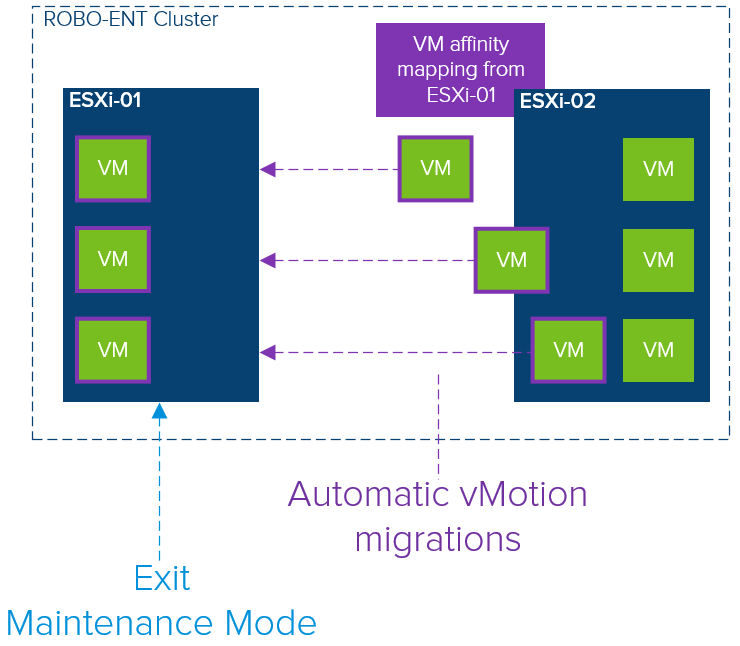 Although being feature-rich, the ROBO clusters lacked the ability of automatic VM (Virtual Machine) migration when entering maintenance mode to perform upgrade or update operations. 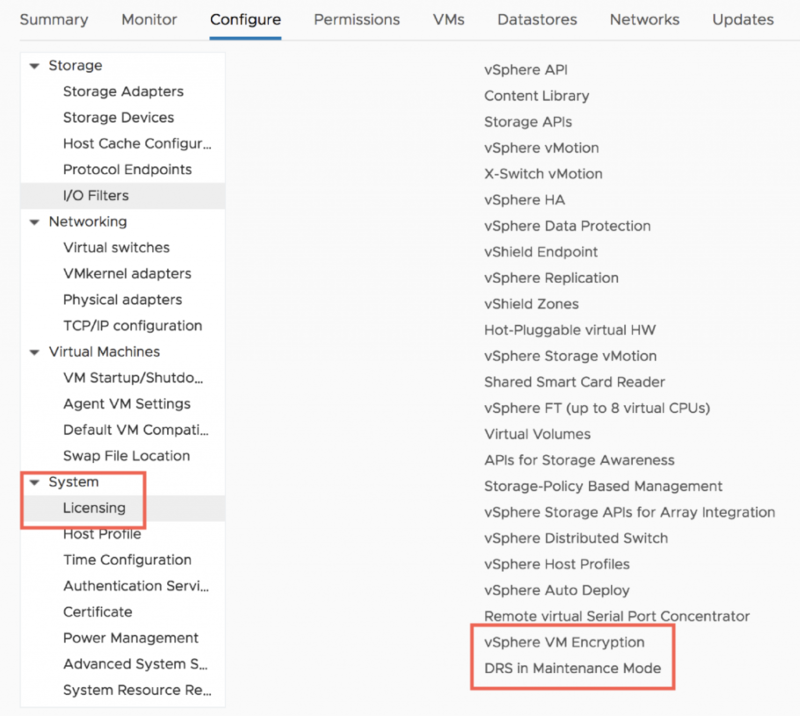 With the announcement of the vSphere 6.7 Update 2 release, we introduce the new ROBO Enterprise (ROBO-ENT) license offering. It includes all the features of the ROBO Advanced license with the added features of VM encryption and DRS-MM (DRS in Maintenance Mode). This post will go into details about this new feature. DRS-MM is a newly developed feature that relies some of the DRS internals of vSphere. It provides the ability for automatic VM migrations when a host enters or exits Maintenance Mode. This is an essential feature for life-cycle management. It is automatically enabled when the ROBO Enterprise license is applied. Important to notice is that DRS is disabled in ROBO Enterprise clusters, even when DRS-MM is activated through applying the ROBO Enterprise license. This is because DRS-MM will not balance workloads like in a typical cluster with vSphere DRS enabled. The sole purpose of DRS-MM is the ability to migrate VMs when hosts are put in maintenance mode. It is recommended not to have affinity rules in place because of the potential negative impact on DRS-MM operations. 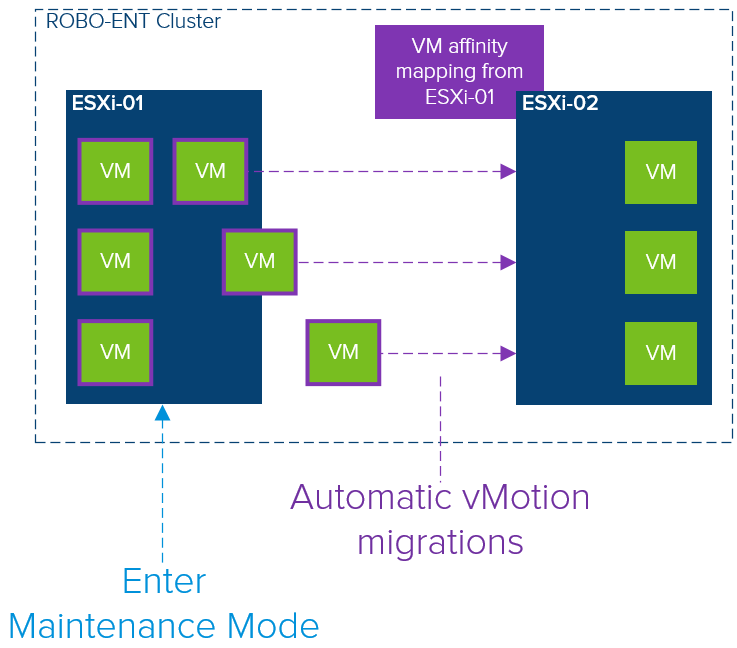 If affinity/anti-affinity rules are present in the system (due to migrating from a DRS supported license to ROBO enterprise license), the automatic VM migration functionality may not work as expected. When a ROBO Enterprise licensed host enters maintenance mode, DRS-MM will trigger the automatic VM migration to other the other host(s) in the cluster. DRS-MM will create internal VM affinity mappings. It uses vMotion operations to evacuate the VMs from the source host. That also means that vMotion requirements must be met for DRS-MM enabled clusters to be able to migrate VMs. Meaning a vMotion network must be in place and adequate resources must be available on the destination hosts to accompany the additional VMs during maintenance. The internal VM affinity mappings are not visible in the UI. When the source host exists maintenance mode, DRS-MM knows what VMs were running on it prior to maintenance mode and will try to migrate the VMs back to it.